Krishna Kanth Park is a public park located in Yousufguda, Ameerpet, Hyderabad, India. The park is decorated with Good Greenery, Gym, Comfortable Sittings and regularly maintained by GHMC. 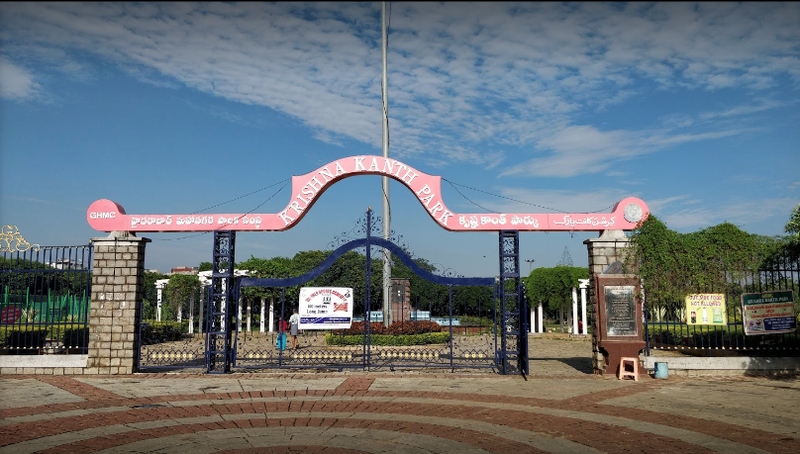 The Krishna Kanth park is located in Yousufguda, Hyderabad, India. Thousands of people visit this place every day from morning to late evening 8:45 PM. People living nearby visit part to walk, jog and exercise every day. The park also has a facility of Gym in the southeastern part of the gym. More than 200+ people visit every morning on a regular basis, Saturdays and Sundays are usually little-crowded compare to working days. A good place to go alone or with a partner. The park is usually below normal temperature compare to the city and one can find peace with a round of walk and sittings available in the park. People usually start at 03:00 PM and leave on max by 09:00 PM. The park is closed by 09:00PM and the security staff force push people to go outside by the help of whistle, stick and torch lights. There is no restaurant or cold drink store inside the park, there is one near the Morning Yoga Point which likely opens to the customer on Weekends(Sat-Sun). You should carry your cold drink and it can be found near the Entry Gate near Temple. If you are visiting in working Days (Mon-Fri) you may not find any store inside but on weekend it is more likely to get some vendors inside the park near Morning Yoga Point. You can easily get chats and snacks outside the park, can also order being inside the park by walking towards the boundary. What are the things Not Allowed inside the park? Playing badminton, Tenis is not allowed. Taking a camera to capture images is officially notified to Public also mentioned in the main entrance of Krishna Kanh Park. Is Food Allowed inside the park? Yes, food is allowed in the park, the public is recommended to use dustbins located across the park. © Reserved Since 2018. Picture Window theme. Powered by Blogger.